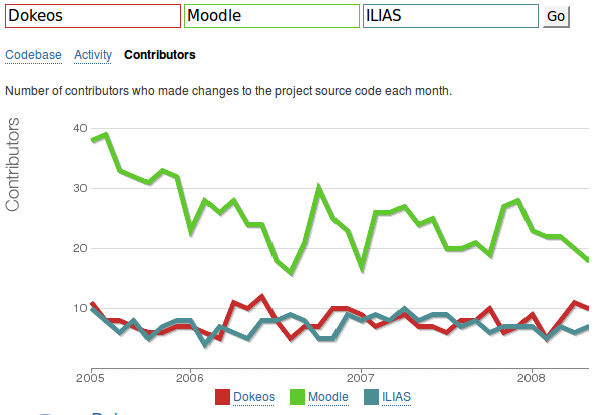 I was playing around a little bit with a code metrics tool on the Ohloh website and, although I’m sure there’s some kind of arguable element there as some included libraries add a lot of “noise” in code contributions, I was happily surprised to see that Dokeos isn’t doing bad at all and is starting to get back at Moodle, in terms of code, contributors and global activity. I’ll let you check that by yourselves (following the “code metrics tool” link, or just looking at the screenshots below). Before you start thinking that this must be a distorted comparison as it is made by a Dokeos developer, I just want to let you know that Ohloh.net is totally independent in this case. I just ran a comparison because there was a tool to do that automatically, and thought the results were interesting and at the advantage of Dokeos and, as such, might be interesting to post here. I totally realise that there is no obvious conclusion to be taken out of these results. 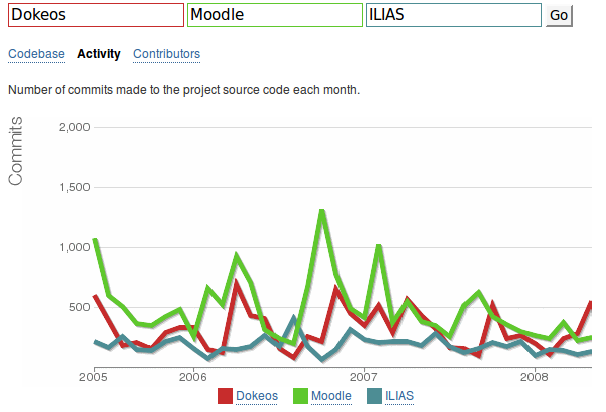 In the screenshots below, Dokeos is marked as red, Moodle as green and ILIAS as blue. Claroline, which I have left out of the comparison because I can only compare three projects at a time, has about the same level in the three graphs as ILIAS (in blue). 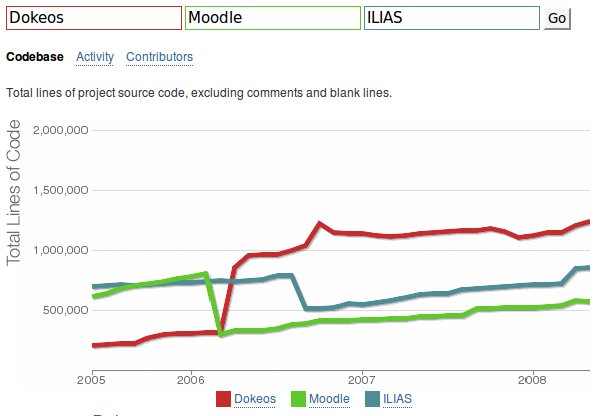 The Dokeos position in that race is not surprising because I feel like crap, instead, it is surprising because it is generally much more heard of Moodle as an active open-source project than Dokeos, so theoretically, Moodle really ought to be on top of these three graphs… go figure! Anyway, the story of Dokeos still has a bunch of nice surprises to come as well. I hope the same is true for our competitors. Just for the fun, if you want to compare Dokeos to Claroline and Ganesha, follow this link. The upper frame has been removed from the learning path after *many* users asked us to, because it used a large part of the screen and didn’t provide much help. There is a “Back to course home” link in the upper-left corner of the page to allow you to go back to the course homepage. There is no “quick fix” to recovering the previous presentation, and there is some coding involved. We always try to follow the majority of our users, and so far (including you) we have only had about 5 people mentioning this change as a “loss”, so turning back would probably not be a good idea. The change in coding should not take too long though, and is mainly based on a difference in newscorm/lp_view.php. I remember posting links to the exact change on the dokeos forum, but I don’t have the link at end (try a search for lp_view.php, maybe). thank you for the answer. I think i should re-enable it since my user will be people with less experience in using computer and internet.